This topic contains 10 replies, has 3 voices, and was last updated by BakerAunt 7 months, 2 weeks ago. My mind has been on blueberries due to the rapidly developing crop in Indiana. I’ve been reading various recipes for canned blueberry pie filling. Almost all of them say that the blueberries should first be blanched for 1 minute in boiling water, then drained (but not given an ice bath) and set aside in a bowl before being incorporated into the pie. According to one recipe, that stops “the enzymes that cause the flavor to degrade during storage” (storage as pie filling). I am glad to know that this step is necessary. It is included in both the recipe Univ. of Georgia that Randy D. recommended, and also in the one on this site from Teaching Cotton. He does two things to compensate: 1) he heats the blueberries until they “sweat and burst their skins,” cools them a bit, then puts them through the coarse blade of a food mill. He suggests that this will distribute the skin equally in the final product, although he notes it is thus “not a jam but . . . a fruit butter.” 2) He also notes Harold McGee says, in On Food and Cooking, that blueberries get their flavor from a class of molecules called terpenes. West says that “terpenes are highly volatile and boil away with cooking,” which might explain why there are so few recipes for blueberry jam. West has two fixes for that. The first is to add some gin, 4 tsp. to 2 1/2 pounds of blueberries in the recipe, “once a gel set is achieved.” Gin has terpenes, and he says that a shot of it will restore the fresh blueberry taste. His second fix, tor those who do not want to use alcohol is to use ground coriander seeds when making the jam and to stir in a Tbs. of lime juice and the zest of the lime at the end. When I told my husband that I need a bottle of gin, he just looked at me. He does not like the taste of alcohol and avoids it. Both of his grandmothers were officers in their local WCTU, so I think that is genetic 🙂 , although his cousins do not appear to have gotten that gene. After reading about blueberry jam, I began to wonder about canned blueberry pie filling. Would it also benefit from gin or lime? It gets processed for 30 minutes when canned. It will also be baked again when it is used for a pie. Would gin or lime, either added to the filling before it is canned, or else added to the pie filling when it is finally baked up into a pie, give it more of the taste of fresh blueberries? Should I give up on canning blueberry pie filling and try to stash away a “pie supply” where my husband won’t grab them to use on his oatmeal? Would a regular blueberry pie, made with fresh blueberries, that initially gets baked at a higher temperature to brown the crust, also benefit from lime or gin? How much experimentation do I want to undertake with our forthcoming precious supply of blueberries? This topic was modified 10 months, 1 week ago by BakerAunt. This is all very interesting, and I need to reread it several times and try to process it all. I do not make/can blueberry pie filling nor do I make jam. I do freeze about 40 quarts of blueberries, from our ten bushes. Frozen blueberries are excellent in muffins or bread – good flavor, not mushy, and the skins are not tough. When I make blueberry pie, I must cook the frozen berries first; otherwise, the skins are tough and chewy. You have to cook them to split the skins. I do not notice any loss of flavor from cooking them at that point. But I have nothing to compare that with. I think the flavor of blueberries varies tremendously depending on the variety. One of my varieties is very sweet, but has no blueberry flavor, some are so-so, and one variety (I have 3 bushes of this one!) is sweet and has a very strong blueberry taste. I wonder why the formerly-frozen berries in a muffin are not tough, but in a pie filling are tough? Hmmm. 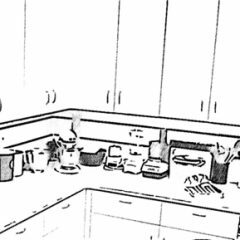 Baker Aunt, I may do some experimenting, but I doubt I do as much or as precisely as you probably will. I do look forward to hearing what you discover! Chocomouse–I’ve been trying to do some additional internet research on the topic. It’s hard because terpenes seem to have a role in marijuana, or at least in its commercial use–and I have to wade through those results to get to the ones on blueberries and cooking. This reply was modified 10 months ago by BakerAunt. Thanks, Baker Aunt! I’ve bookmarked both sites and glanced at the articles, and I’ll most definitely make that ice cream soon. The scientific article will have to wait a couple of days – the forecast is for perfect gardening weather, so I must pull weeds today. Today, my husband and I went to our local blueberry place and picked 20.25 pounds. I’m taking a break from stowing them away. Some are going into quart freezer bags (4 1/2 cups per bag), so that my husband can have them during the year for his morning oatmeal–and maybe I will also be able to use them for some baking projects. I’ll be setting some aside for a fresh blueberry pie, and blueberry hot cross buns and blueberry muffins are also in the immediate future. We plan to pick more berries in a couple of weeks. I have not yet resolved what I will do for canned blueberry pie filling. I bought some limes, so I may try stirring in some lime juice (in addition to, not in place of the lemon juice) and see what that does to the flavor. Of course, it will be a while before I crack open those canned pie fillings for pies–and maybe for sweet rolls. Another alternative might be to add the lime juice after opening a jar of the filling before using it in a pie. Or can the terpenes in limes endure the high heat of canning? This reply was modified 9 months, 2 weeks ago by BakerAunt. I checked my blueberries today, and found they are just starting to turn blue, so it will be a while yet. My first project (after eating a bowl full of just plain berries!) will be a blueberry cream cheese braid. 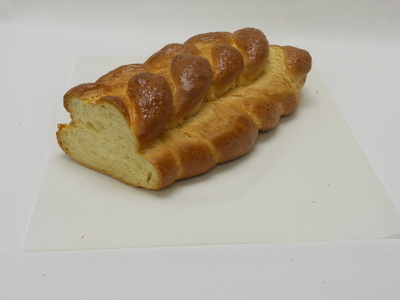 It is based on KAF’s Braided Lemon Bread – with variation. I make a layer of a thickened sort of blueberry pie filling and a slightly sweetened cream cheese layer before braiding. Sometimes I use lemon curd and thickened blueberries. Baker Aunt, my husband prefers our blackberries on his Frosted Flakes 365 days a year! This reply was modified 9 months, 1 week ago by BakerAunt. How about rum, for mojitos? I picked blueberries today for the first time this season. Last week they were extremely tart and not very flavorful. These are much better, but they will be even sweeter next week. I have one variety, Earliblue, which is sweeter and more flavorful than my other varieties. One variety is very sweet, but has no flavor! I always pick from several bushes, so that I get a mix of varieties. You might find, Baker Aunt, that the next berries from that farm are sweeter than the ones you got this week. Thank you for the information Chocomouse. We did pick earlier this year, since we now live here. Usually we would have been picking either this week or the next. We will have to go back and pick more! My husband planted our two blueberry bushes out front this morning. He’s put cages around them to keep the little critters out and he has spread coffee grounds around to deter the deer. Speaking of blue berries and science… I just found this link – a planet made of blueberriesa planet made of blueberriesa planet made of blueberries! Aaron–thanks for such a fun article. I read it to my husband (plant physiologist), and he was laughing too. I suspect that if more discussions of the kind alluded to in the article had been available in high school, more people would have rushed to take physics. The only food example I can recall from my high school physics class was that of raisins in yeast dough that move further and further away from each other as the dough rises. It was used as a model of the expanding universe. I’m not sure, but I think that may be where my fascination with yeast breads started. My Nebraska Kitchen now has a Daily Quiz question! 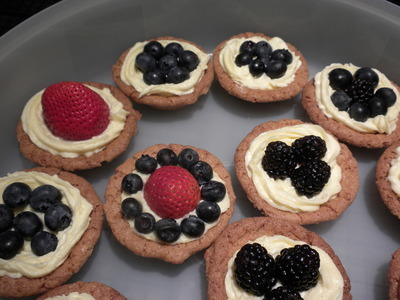 Sable Breton Tarts filled with Mousseline and topped with assorted fruits .